DD5LP/P – November 15th. 2017 – DM/BM-135 Hesselberg. With the big EU-NA S2S event approaching on the 18th. I had been trying to get out to a summit to do some more preparation and testing for the last week but weather and other commitments had stopped me up until this Wednesday opportunity. I could have gone to one of my semi-local summits but as well as testing a new antenna (more later on that), I also wanted to get at least 6 activator points, so that the activation on Saturday the 18th. with its 10 activator points, would break the 500 level as an activator (half a goat if you wish). All of the semi-local summits that could supply the needed 6 points or more were now off-limits as a part of the trip up these mountains needed the use of a lift and in Bavaria all Alpen lifts go out of service around November the 5th. until just before Christmas for maintenance and inspection work prior to the Ski season and their heavy usage. Looking around, I realised I hadn’t activated either Duerremberg or Hesselberg this year, each of which are about 2 hours drive away from my home QTH and both are worth 6 points. Initially I thought I might activate both but later decided to concentrate on the easier access Hesselberg and get to see the views from the summit. Duerremberg is a forested summit and hence has limited views and also impacts the use of vertical antennas – which is what I wanted to test. From previous blog entries and construction pages on this vk2ji.com website, you’ll know that I built a combined 20m, 17m and 15m J-pole antenna by using a loading coil at the bottom for 17m and 20m. This was the antenna that I tried to use as a sloper antenna on my last antenna testing activation at Peissenberg. Using that antenna as a sloper, especially relatively close to the church building did not work out very well. In the meantime, Christos SV2OXS tipped me off about a commercially built vertical antenna, from LambdaHalbe (the same company who supply the lightweight 6m portable masts). Although sold as an end-fed halfwave it is indeed a J-pole of the same design as I had used for my home-made antennas. I bought the 20m QRP version of this antenna and I decided to test that against the home-made tri-band one at Hesselberg to decide what to use for the NA-EU S2S event on the 18th. Hesselberg is located north of Augsberg and about half way between Ingolstadt and Stuttgart. It has the advantage that having a Radio transmitter mast on top of it, there’s a road almost all the way to the top. this is also a health resort area and hence access to the summit for walkers is well-defined. There are even disabled persons spots in the car park, making this summit a possible for disabled operators although some help getting up the last few metres to the summit would be needed as it’s a rough track. At the summit, as well as the standard cross, there is also a mini-cross and a trig point stone along with an information board and a table with bench seats at each side of it. The drive across was uneventful and the weather was clear. That was until, …. I go to about 500 metres down the road from the summit. At this point visibility dropped drastically and I was in a combination of freezing fog and low cloud. Guess what – I couldn’t see any of the views from the summit AGAIN – like my last visit! What is it with this mountain? In any case, once I arrived at the car park and unpacked, I was about 30 minutes ahead of schedule, which is always good and in this case, as I was setting up two masts rather than the usual one, the extra time was useful to have. Initially it didn’t feel so cold but as time went on during the activation, I started to feel the cold more and more and when I eventually packed up and took down the antennas, ice had actually formed on the top og the J-pole wire! I set up the lambdaHalbe 20m J-pole on my DX-Wire 10m mast at the end of one of the bench seats (which of course collapsed into itself for two sections at the top just as I was pushing the last section from the bottom out and so had to be lowered and re-erected). I actually wound the mast as I put it up, so as to have enough space for the driven element to be still on the pole. I have tried this method before and having a J-pole’s driven (half wave) element in a spiral rather than true vertical configuration appears to make no difference to the antennas performance. The home-made (loaded) J-pole antenna went onto my LambdaHalbe 6 metre mast at the opposite end of the other seating bank and both coaxes came back to the centre of the table, allowing a switch of antenna to be a simple unplug of the BNC connector from the amplifiers output socket and plug the other one on. On 20 metres the amplifier outputs between 20 and 25 watts dependant upon the state of the battery. Even just on receive, I could notice an immediate difference between the commercially made, single band 20m jpole on the 10m mast and my home-made, loaded version on the 6m mast of around 3-4 S-points. Transmission tests with Lars SA4BLM and Cam G0CAM confirmed a similar difference on transmit. Later contacts who had been listening gave reports of similar levels. After the two very clear tests however, it was obvious, that a combination of being a single band antenna, not having a loading coil in circuit and being a little higher (although I don’t think the height was critical) makes the LambdaHalbe, the clear choice for use in the S2S attempts between the US and EU. 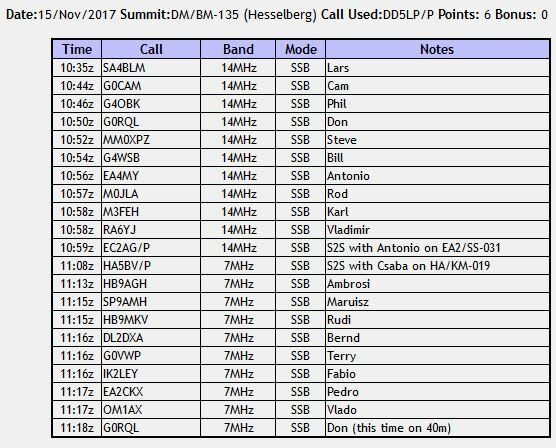 As you’ll see from the log below, I did manage several contacts on 20 metres and despite some very deep QSB, I was happy with the performance of the set-up completing 20m operations with a nice S2S with Antonio EC2AG. As I saw some other activators on 40 metres where an S2S contact may be possible, I took down the home-made antenna from the 6m mast and put up the SOTABeams linked dipole. Interestingly, this usually very effective and reliable antenna didn’t seem to perform as well as normal as I had some difficulty getting the S2S contact with Csaba HA5BV. While I worked several other stations on 40m before packing up, there were no more S2S contacts. All in all, the activation completed the planned tasks of testing the new LambdaHalbe antenna and gaining 6 activator points but I was a little disappointed at the low visibility from the summit again. As I drove down the road, the air cleared, so I suspect this was possibly low cloud cover on the summit rather than fog or mist. SOTABeams Bandhopper linked dipole plus home-made loaded J-Pole for 20m and LambdaHalbe “End Fed Half wave” (J-pole) for 20m. Lambdahalbe 6m fibreglass mast. DX-Wire 10m portable mast. Modified QAMP amplifier (30-35W on 40m, 20-25W on 20m). The new LambdaHabe 20m J-pole is a success and will be the antenna I will use on the NA-EU S2S event. The DX-Wire 10m pole continues to give me problems but I will have to manage those as I need the full 10 metres for the antenna. Lets hope band conditions improve by Saturday for the EU-NA S2S event! This entry was posted in SOTA and tagged DM/BM-135, Hesselberg, SOTA by VK2JI DD5LP G8GLM. Bookmark the permalink.